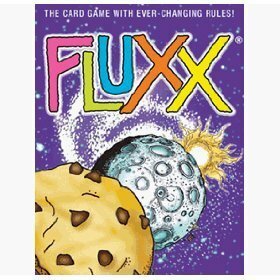 Teach reading skills and following directions, as well as strategy with this great card game, Fluxx (by Looney Labs). Every game is different. The instructions on the cards played make the game. There are no rules to memorize because the rules will change as the game is played. The object of the game is to put together a set of "keepers"- cards that create a theme, i.e., milk and cookies, love and peace, time is money, etc. There are several different versions of Fluxx. The original game, Eco-Flux (green theme), and Family Fluxx. Newer versions of the game are Zombie Fluxx (for horror fans) and Monty Python Fluxx. There are expansion packs available and the original game comes in Spanish, Japanese, German, and Dutch. You can even purchase blank cards and add your own rules, keepers, creepers, and such. I have personally played every version except for Family and the new Monty Python versions. I would have to say Zombie Fluxx is my favorite, though it isn't suitable for younger players. In case you can't wait for it to come from Amazon, take a trip to your local Target! An actual play of this game. Check it out and see for yourself! *WARNING PARENTS* I reviewed this video. Yes, it does show four adults playing the game, but the language is offensive at times. Even though it will help you to understand and play the game the first time, you may NOT want your children to see it. I was hoping to go to Target or WalMart and just pick this up, but neither of them carry it. However, Amazon does! And they had a great review written about it, also. Will have to get one ordered quickly as we have a family reunion coming up! Thanks for the tip!